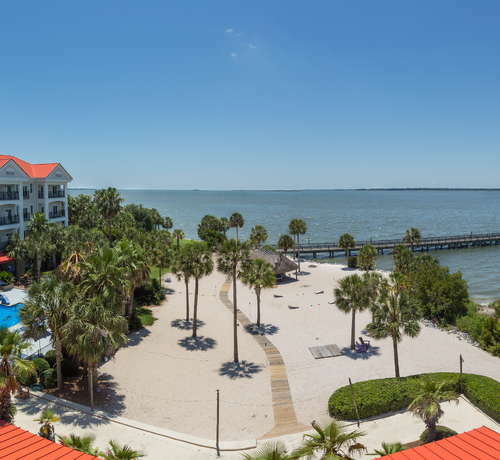 Tucked on the southwest corner of Mount Pleasant—right across the Cooper River from downtown—is Harborside at Charleston Harbor Resort & Marina. 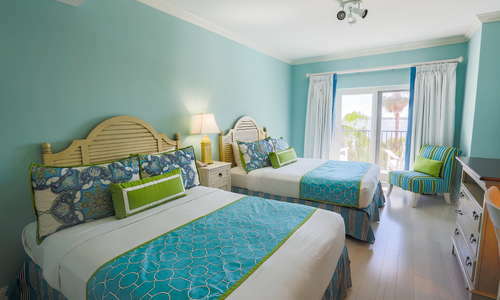 Kids will love it here, with its pool, sandy beach, and colorful rooms. Parents will appreciate the on-site restaurant, front-row seat to sunset views over Charleston Harbor, and add-ons like a kids’ morning camp during summer months. A palette pulled from beach umbrellas—think lime green, pink, bright yellow, indigo blue—colors guest rooms. 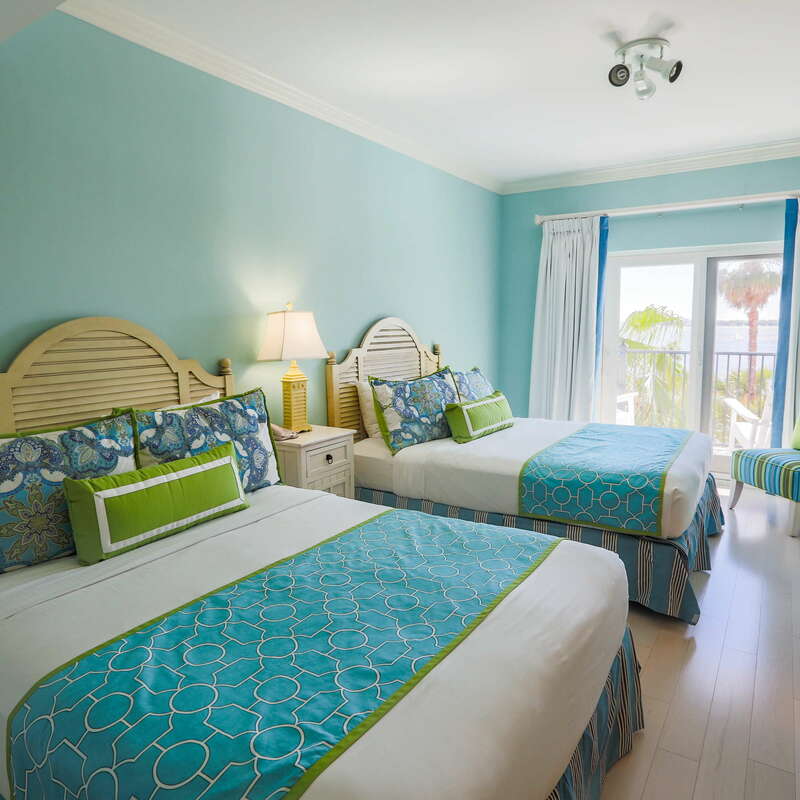 Options range from Traditional rooms (small with basic furnishings) and Deluxe (boasting a fireplace, sitting area, and built-in cabinetry) to the Two-Bedroom Admiral Suite (well suited for families, you’ll get two bathrooms and bedrooms). Some rooms offer private balconies complete with a pair of Adirondack chairs; all have comfy pillow-top mattresses. YOU SHOULD KNOW Décor is over-the-top coastal, with seashell and sailboat motifs in some rooms. It’s fitting for the family-friendly hotel’s waterfront location but may be too hokey for certain travelers. Tubs have been modernized with glass doors, and the vanity space is just wide enough. YOU SHOULD KNOW The bathrooms are starting to show wear and tear. 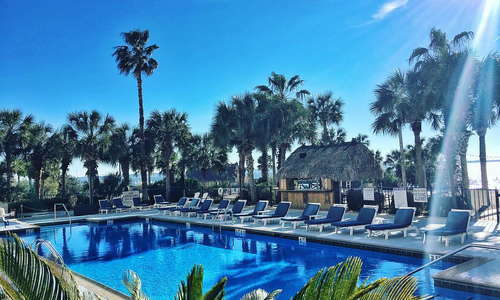 The pools at Harborside and its sister property next door, The Beach Club, put the “resort” in Charleston Harbor Resort & Marina. 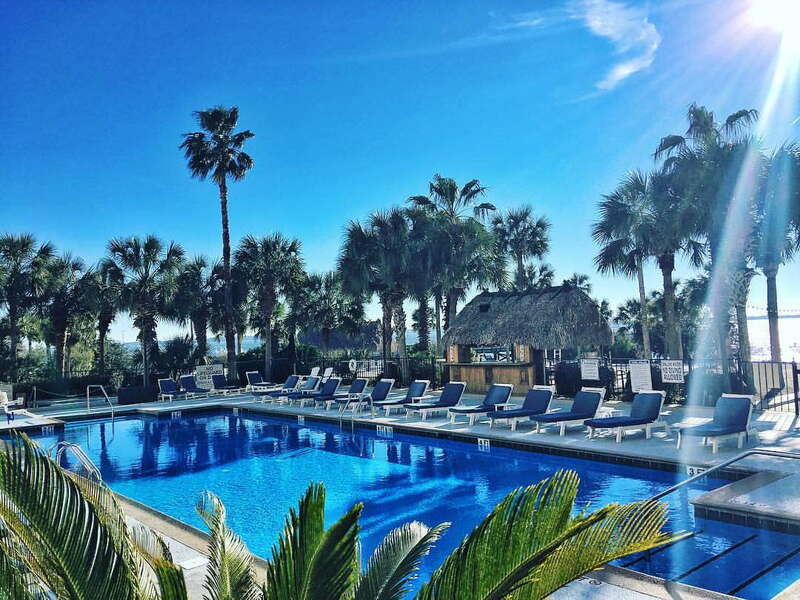 At Harborside, lounge by the long pool—afterward, build sand castles or play corn hole with the family beneath palms in the beach area. Head to the adjacent Beach Club for multiple pools and a hot tub, cabanas, and games like life-size chess. Poolside bars at both properties keep the libations flowing. For a livelier vibe, head to The Beach Club’s pool deck. Dressed in soothing coastal colors, the peaceful Estuary Spa—located next door at The Beach Club—serves up massages, beauty treatments, and organic Naturopathica products. With both aerobic and anaerobic machines, the onsite gym is open 24/7 and will get the job done. Rent cruisers to bike around Patriots Point or break a sweat on the jogging trails nearby. Extensive breakfast, lunch, and dinner menus are offered at the resort’s Fish House restaurant, which wears modern maritime décor and boasts brilliant views of the USS Yorktown. Quick bites can be ordered poolside, as well. YOU SHOULD KNOW The Fish House is two doors down from Harborside. It’s not far—a two or three minute walk—but, if it’s raining, you’ll have to brave the elements on your way to breakfast. There are a handful of waterholes throughout Charleston Harbor Resort & Marina properties. For noteworthy views, try the Fish House’s Bridge Bar. For relaxation, order a daiquiri from one of the poolside bars. Park your car in the lot out front (parking’s included in a resort fee you’ll pay with the room), Ride the Charleston Water Taxi ($6 one way) from the marina to Waterfront Park or Aquarium Wharf. Take the resort’s complimentary shuttle to and from downtown throughout the day and early evening. Use ride-share for late-night travel. Want to stay on the Mount Pleasant side of the Cooper River for meals? Try Vintage Coffee & Cafe (9-minute drive) for fancy espresso drinks and breakfast or Five Loaves Café (12-minute drive), beloved for its delicious soups, salads, and sandwiches. During a beach day on Sullivan’s Island, order the nachos at Home Team BBQ. Don’t leave Home Team BBQ (17-minute drive) without sipping their famous frozen rum cocktail, the Game Changer. For a late night out and sports bar vibe, hit up The Shelter Kitchen and Bar (8-minute drive). 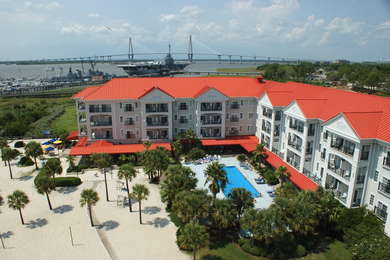 The views of downtown Charleston and its harbor are quite memorable and the beach area and docks will entertain your young ones all vacation long. The hotel is more economical than its luxury sister property next door, yet provides access to The Beach Club’s pool deck and spa.